There were many interesting new biotechnologies published in 2016, so it was difficult to narrow it down to just 10. I ended up picking ones that either may have exciting potential to be directly translated into the clinic, or may represent approaches that I think will be important directions where biotechnology can go in the future. Here are the first 5 of my top 10 biotechnologies published in 2016 (in no particular order). Part 2 of my top 10 can be found here. There were three papers that came out this year on new ways to deplete hematopoietic stem cells (HSCs) to allow transplantation without the toxic myeloablative conditioning regimens that are currently used. One of the problems with conditioning regimens is they severely compromise the immune system for prolonged periods, making patients susceptible to life-threatening infections. These approaches were all tested in mouse models of transplantation and potentially reduce compromising the immune system. These could immediately be applicable to autologous stem cell transplants and gene therapy approaches of ex-vivo modified autologous cells. In fact, in bluebird bio's gene therapy trials, their main toxicities, so far, have been due to the conditioning regimens. How well these approaches would work in conditioning for allogeneic transplants is less certain, as depletion of the host immune system plays a role in allowing the engraftment of the donor HSCs. There may still be benefits (no genotoxicity & organ damage) if these approaches are combined with immune-depleting approaches (as done in the second paper) to allow allogeneic transplant. Below are the three approaches, with a brief description of each. This study used an antibody-toxin conjugate (CD45-saponin) to deplete hematopoietic cells. They found this molecule was able strongly deplete HSCs in mice, and allowed faster immune reconstitution with only transient depletion of B and T cells compared to irradiation. This approach allowed high levels of chimerism (>60%) after transplant in immunocompetent hosts. Magenta therapeutics has recently been founded to bring this approach, along with a number of other transplant-improving technologies, to the clinic. In this paper from Stanford, continuing with their evaluation of the effects of CD47 antibodies (previously tested in cancer & atherosclerosis), they used a CD47 mAb to potentiate the effects of c-Kit antibodies to deplete HSCs. c-Kit is present on HSCs and their downstream progenitors. They were able to achieve high levels of chimerism (~60% HSCs) after transplant in immunocompetent hosts. 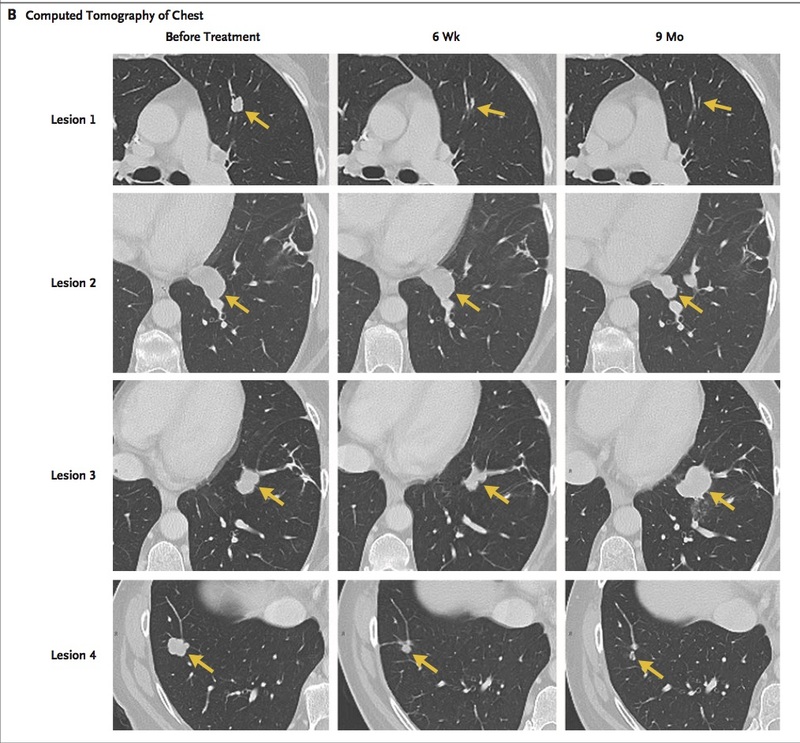 Unlike the above paper, they also tested the ability of this approach in a more relevant model of allogeneic transplantation - transplanting between two different mouse backgrounds. For this they combined their approach with CD4/8 antibodies to deplete T cells to allow further suppression of the immune system and allow allogeneic engraftment, and were able to achieve ~20% HSC chimerism. A concern with this approach, which was brought up in the first paper above, was that c-Kit is also present on cardiac progenitors, gastrointestinal cells, neuronal cells, and cells of the reproductive system. Additionally, in the paper above, they found that attempting to potentiate the c-Kit antibody by conjugating it to saponin did not improve its efficacy, although this could have been for a number of reasons. Finally, in this most recent paper, the authors found that depletion of the amino acid valine prevented HSC proliferation both in vitro and in vivo. Valine-free feed in mice also caused partial depletion of immune cells. Valine depletion in feed for three weeks allowed transplantation in immunodeficient and immunocompetent mice, but at much poorer levels of chimerism, ~10-30% vs. 60+%, compared to the above two approaches. Additionally, if valine was reintroduced into diets immediately, it would cause "refeeding syndrome" which was lethal in 10 of 27 mice, but was able to be avoided if valine was reintroduced slowly. This approach seems the furthest away from translation to the clinic of the three. I thought this paper was really interesting because it addressed a significant problem, resistance to the major insecticide, Bt toxins, by using directed evolution, an approach that is both tremendously powerful and versatile. Powerful because it uses rapid evolution to let nature figure out solutions to difficult problems without much a priori knowledge, and versatile because the general theme of directed evolution can be applied in innumerable ways depending on how you set up the experiment. For Bt toxins to work, they need to interact with proteins on the surface of insect midgut cells. Insects have started developing resistance through mutation or loss of expression of these surface proteins. The Liu lab decided to evolve Bt toxins to bind to a different midgut surface protein allowing continued insecticidal activity. To accomplish this, the Liu lab has developed a directed evolution strategy called PACE (phage-assisted continuous evolution) which they used here to evolve protein-protein interactions. They have previously used similar direction evolution approaches to evolve gene editing proteins to improve specificity or to identify resistance mutations to HCV drugs. Here, they used PACE to evolve the Bt toxin (Cry1Ac) to bind the insect protein TnCAD, a protein structurally related to the toxin's normal target. The general scheme is shown below. They are using phage which need to bind to and enter bacteria to complete their life cycle. To bind bacteria they need to express the pIII protein, but the system is engineered so that the pIII protein is only produced if the phage expresses a Cry1Ac variant (evolving protein) that can bind to TnCAD (target). There is also a mutagenesis plasmid that causes continuous mutation to allow continued evolution in the reactor. 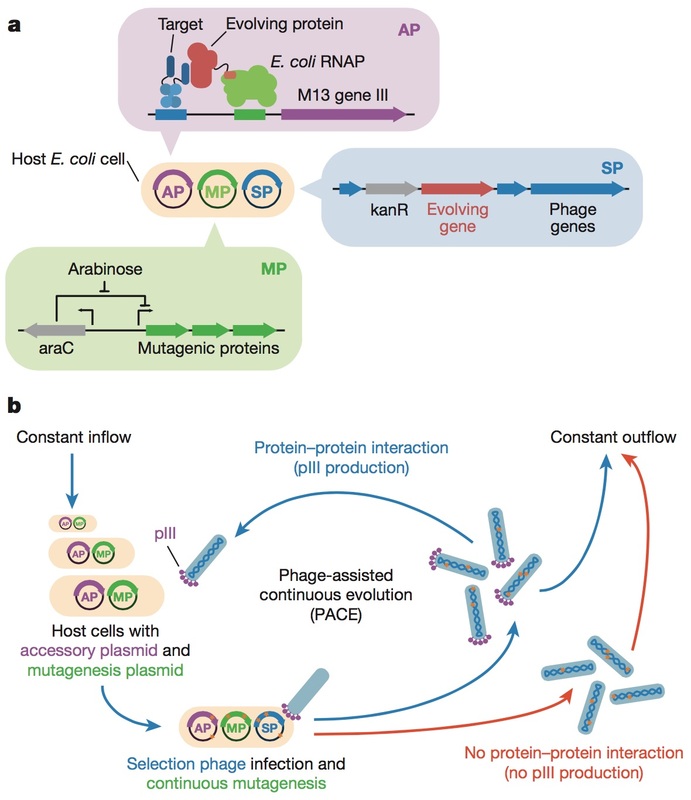 The reactor has constant inflow and outflow to allow selective pressures to generate the enrichment of phages containing TnCAD-binding Cry1Ac variants. In the end, they were able to evolve new Bt toxins that could interact with these alternative targets in insect cells. These Bt toxin mutants were found to be much more potent insecticides, especially against Bt toxin-resistant insects, and could lead to the production of new insecticides. For more detail, Derek Lowe also wrote an excellent commentary on this paper on his blog. Human cytomegalovirus (HCMV) is a generally asymptomatic virus that can cause serious complications in immunosuppressed patients and newborns. There currently is no effective vaccine, and there are multiple reasons why vaccine approaches have been difficult to develop. One interesting obstacle is the ability of HCMV proteins to downregulate MHC-I expression and evade CD8+ T cell responses. Previous live vaccines were attenuated in multiple ways, including mutations to genes in a pentameric protein complex that prevented viral entry into epithelial cells. For this vaccine, the authors restored this ability. 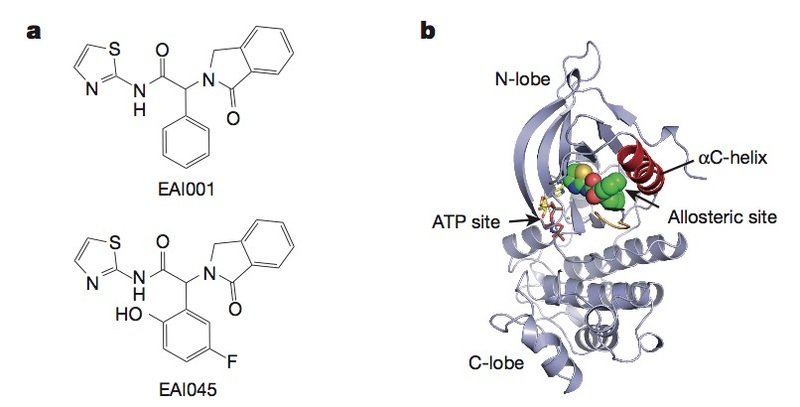 Since this modification could strengthen the infectivity of the virus, they attenuated it further by making two essential HCMV proteins unstable in the absence of an artificial ligand (Shld-1). This system uses a degron tag based on FKBP, which binds, and is stabilized by, the rapamycin-analog Shld-1. To produce the vaccine, ligand is present during production, but is not present once given to the patient. They found the more active virus was able to produce a neutralizing antibody response against the pentameric complex, present in natural immunity to HCMV, but lacking with previous vaccines. It was able to produce this neutralizing antibody response (and CD4+ and CD8+ T cell responses) against HCMV in mouse, rabbit, and non-human primate models. This vaccine was developed by Merck and a clinical trial is ongoing (link). Sometimes the publication of a product by a biotech/pharma company could suggest that they are no longer interested in it. However, for what it's worth, the authors at least state at the end that "Preliminary data from our ongoing clinical evaluation suggest that V160’s safety and immunogenicity profiles in human are consistent with those described in this preclinical study. V160 is therefore a promising vaccine candidate against congenital HCMV transmission." Recently, there has been an interest in developing HCMV as a therapeutic vaccine vector to treat other chronic infectious diseases, such as HIV and tuberculosis. Vir Biotechnology recently raised over $150 million primarily centered around the development of HCMV vaccine vectors pioneered by Louis Picker & Klaus Frueh's group. One interesting thing to add is that Picker's group found that disruption of the pentameric complex (loss of Rhesus virus ortholog of UL128 & UL130, with mutations in the pentameric complex restored in Merck's vaccine) was necessary to allow the unusual MHC-E restricted immune responses they see in response to their CMV vaccines. Cell therapies have exploded in popularity since the impressive early results of chimeric antigen receptor T cells (CAR-T) in ALL. The surprising potency of these cells, and the fact that they can persist in the body, can differentiate these therapies from other antibody-targeted therapeutics. However, one of the truly unique features of cell-based therapies is the ability of a cell to contain much more information than a small molecule or biologic could. 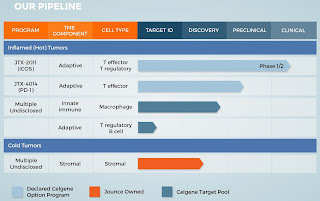 In addition to adding a targeting domain and T cell activation domain, one could modify cells to do a whole host of other processes. Tools are now being developed that will hopefully be able to unlock the programmable potential of cell therapies. Wendell Lim's group has published three (!) 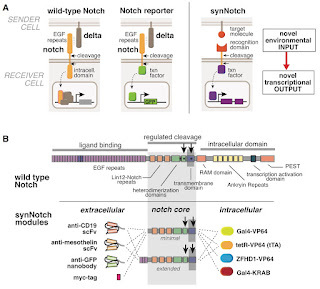 Cell papers this year on their new synthetic notch receptors (synNotch), which allow customizable programming of cell responses in adoptive cell therapies. The first paper describes how synNotch receptors work. Normal Notch receptor signaling is very simple, the Notch receptor binds to its ligand, which stimulates the separation of an intracellular signaling domain that can go on to affect gene expression. 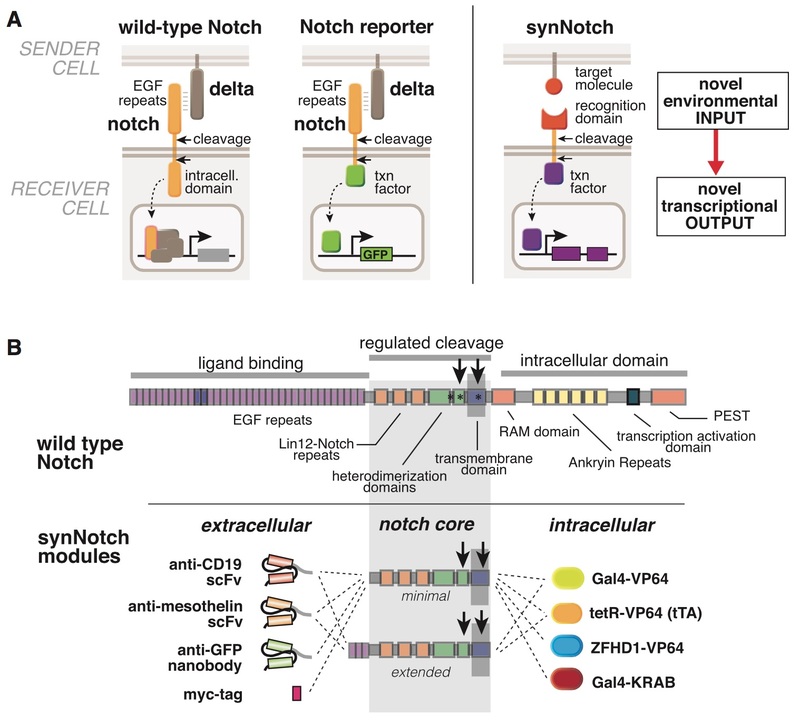 Previously, Notch reporters have been developed that contain the same Notch receptor extracellular domain, but with a transcription factor internal domain that can activate GFP to report when Notch signaling is activated. The Lim lab modified this further by coming up with many different potential extracellular domains beyond the Notch receptor to allow this cassette to respond to different inputs, as well as different intracellular domains to allow it to react differently to these inputs. The schematic is shown below. In this first paper they use synNotch receptors in a variety of ways in additional cell types other than T cells. Additionally, more than one synNotch circuit can be used even within the same cell. 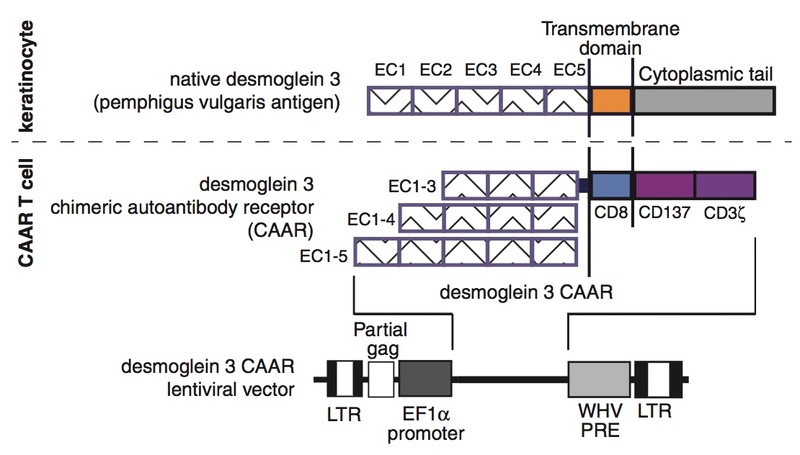 In their second paper, published back-to-back in Cell, they used a synNotch circuit to increase the specificity of CAR-T cells to require the presence of two antigens. Normally CAR-T cells are directed against a single antigen (CD19 etc.) however, not many cancers express a surface antigen that is specific only to the tumor and not essential normal tissue. To increase specificity, a number of groups have developed approaches to require the simultaneous presence of two antigens on the target, which will hopefully single out tumor cells and reduce activation against normal cells possessing only one of the two antigens. The Sadelain lab has also published approaches requiring target cells to possess two antigens simultaneously or specifically one antigen but lacking a second. The Lim lab used their synNotch circuit to direct expression of the CAR only when the T cell binds a first antigen, with the CAR recognizing cells containing a second antigen. The schematic is shown below. They make T cells that should react only against cells with two (artificial) antigens, and find that the cells do in fact have specificity for cells expressing both. In vivo, when cells expressing one antigen were injected in one side of a mouse and cells expressing both were injected on the other, the engineered cells primarily localized and prevented the growth of the cells expressing both antigens. The ability to maintain specificity to both antigens will be critical for safety, as there is the potential for the CAR to be expressed after interacting with antigen A, and then be able to move around the body and react with a normal cell that only expresses antigen B. However, the ability of a T cell to make decisions from two inputs instead of one could potentially drastically increase the tumor types and targets amenable to CAR-T targeting. This is one of numerous ways to use T cells to cause local changes, which could be critical for enabling higher local concentrations or decreasing systemic concentrations of molecules that could have undesired systemic effects. 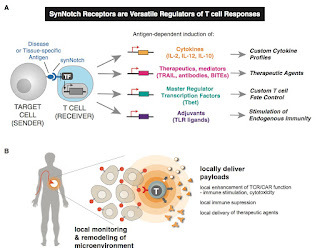 The synNotch platform is impressive due to its modular nature and ability to be customized, which perhaps will allow it to be applied to multiple therapeutic applications. One potential concern with all of these approaches is the potential immunogenicity of these additional proteins being produced by the cell. 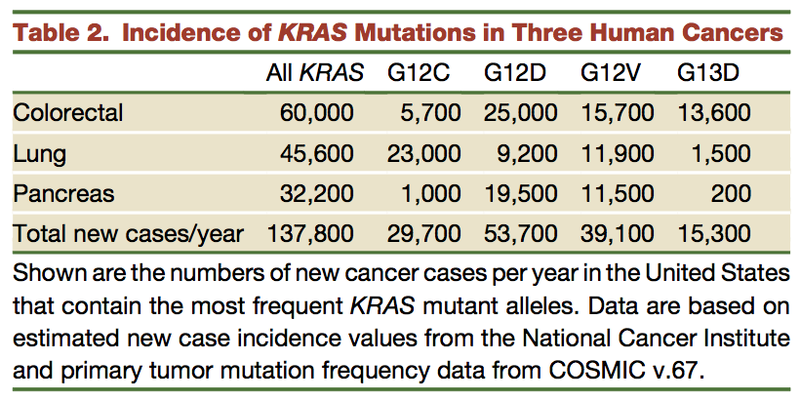 Although how much, if any, this will limit cell persistence/activity is unknown. 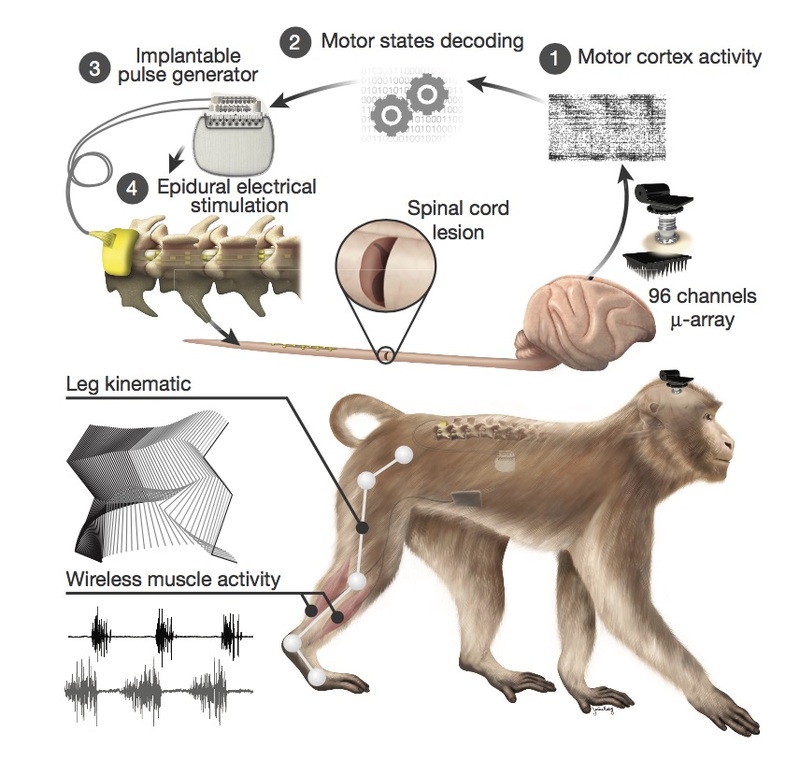 This work is being commercialized by Cell Design Labs, as a spinout from the Lim lab. 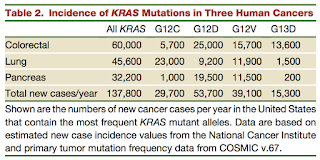 There has been an increasing realization of the importance of the endogenous immune response against neoantigens, immunogenic mutations present only in a patient's cancer. Clinical trials of tumor infiltrating lymphocytes (TILs) and checkpoint inhibitors, like anti-PD-1 and anti-CTLA-4, have demonstrated that the reaction against neoantigens may be critical for the efficacy of these therapies, and boosting a response against neoantigens is an attractive therapeutic approach. 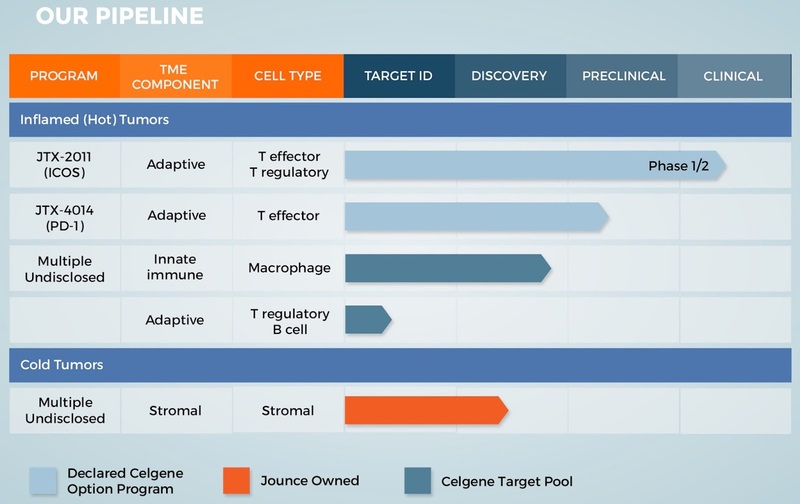 Directly targeting neoantigens, with vaccines or T cell receptors (TCRs) is complicated by identifying which ones to target. 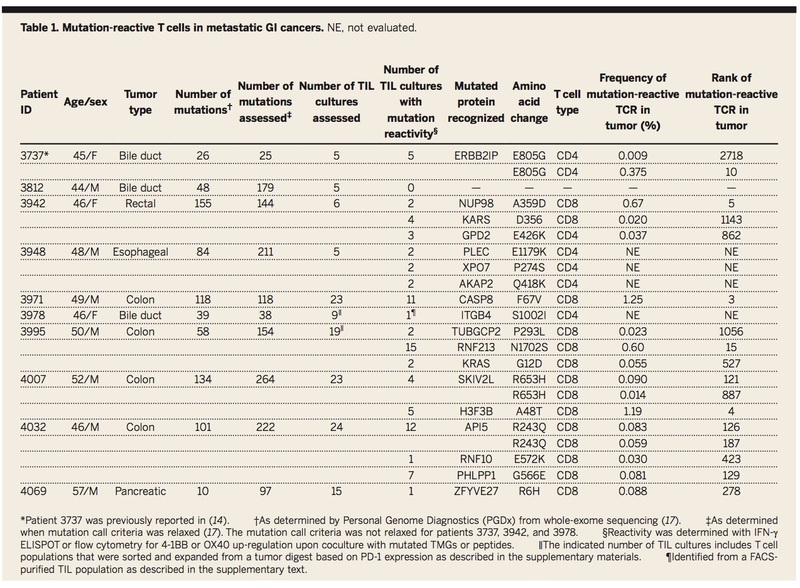 Steve Rosenberg's group has done a lot of work with TILs and has demonstrated that T cells present in the patient's own tumor can react against specific neoantigens and induce long term tumor regressions (examples here and here). 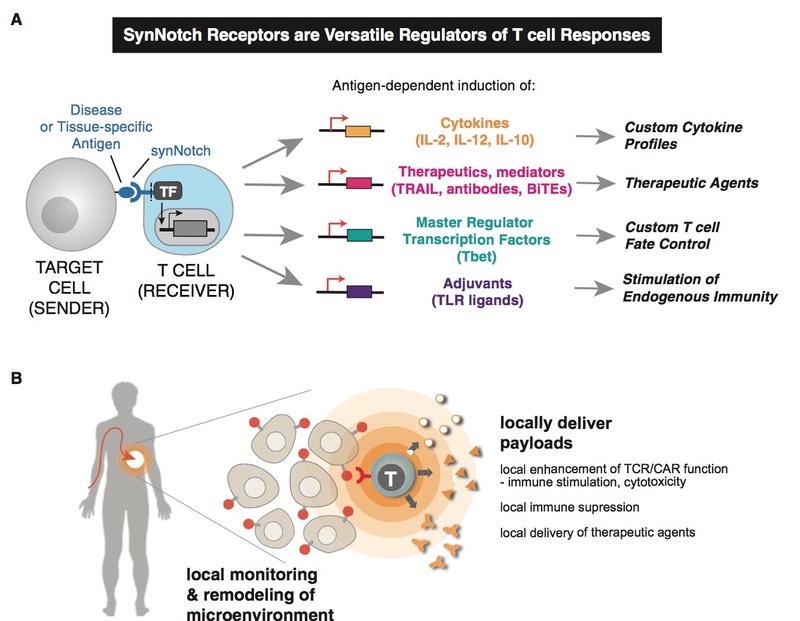 One questions is whether or not the patient's own immune system has produced a robust response against all the potential immunogenic antigens to allow all potential reactive T cells to be detected. This is what Ton Schumacher's group set out to investigate in this paper, where they attempted to identify if T cells existed in healthy donors that could react against patient-specific neoantigens. The authors used autologous dendritic cells (from donors) loaded with tandem minigenes expressing different predicted neoantigens present in a patient's tumor, and cocultured them with donor T cells to determine if the T cells could react against any of the neoantigens. Across three patients, they could identify T cells reactive against 11 of the 57 predicted neoantigens. 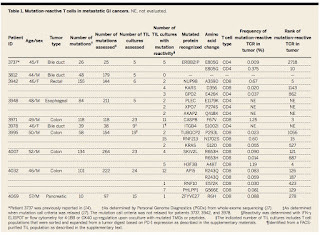 Only 1 of the 11 neoantigen-reactive T cells was detectable in TILs from a patient, indicating this is a way to identify a broader repertoire of TCRs reactive to patient-specific mutations. Additionally, this study attempted to expand our understanding of what makes an immunogenic neoantigen. They found that higher stability of the peptide-MHC complex for a neoantigen was statistically significantly associated with being able to identify T cells reactive against it. 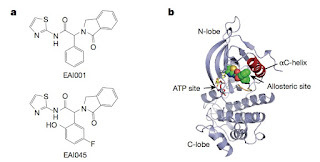 This approach provides a way to prospect for neoantigen-reactive TCRs and expand the pool of potential TCRs beyond what is found in a patient, with potentially significant implications for neoantigen-targeting therapies.